Doing the Silly Dance with the audience! Our New Book/CD combo! "Springtime Dance"
Award-winning artist, Valerie Leonhart Smalkin and Silly Goose present energetic song-filled performances, populated with a magical array of puppets, bold-voice talents, and contagious dances that will surely get you and your little ones up, moving, and laughing together. As a recipient of a Maryland State Arts Council grant for solo non-classical performance in 2015, and for solo-theatre-performance in 2016 and 2019, Val's 40 minutes of music, puppets, ventriloquism, dancing, singing, and 100% audience participation will delight the child with and in you! We just saw Val and Silly Goose at the Albany Public Library. The act was Phenomonal!! I don’t know who had the most fun- my kids or me. I wish we were on the east coast so I could get her for my kids birthdays. How kind of you to post a review here! As an audience you Albany, CA folks rocked! I did not need to coax any of you into singing or dancing. It was my pleasure. <3 If your kids' birthdays are between June 26 and July 9, it could work? I'll be on tour in CA again between those dates. Silly Goose & Val were great! Val was very entertaining. She was loved by both the kids & adults and got everyone involved. I will definitely pass her name on............she & Silly Goose were wonderful! Thank you Sue! I had a great time at the Dallastown Volunteer Fire Department's annual Christmas party! Val was GREAT and a hit with parents and children! She was simply amazing!!!!! So happy to have had her at our children's bday party! Thank-you! You and your family are great as well! It makes all the difference in the world! We booked Val for a "Take Your Kids to Work" Day event in April 2015. She was supremely awesome! An absolute professional at the highest degree. All of the parents were absolutely amazed when our normally shy children glued to her. Our general manager thought it was impossible for her son to detach from her. However, almost ten minutes into Val's performance he went to the front row! She is absolutely amazing and we're ready to book her again! Val provided the entertainment for my daughter's 1st birthday. I know what your thinking...really...a 12 month old but the kids at the party ranged in ages 3 to 7. My guest are STILL talking about how much fun they had...adults and kids! Val not only put on a great show but she really participated and assisted in every aspect of the party. Thanks so much for helping to make such a memorable day for my family! And your family was the best! Grandparents, aunts, uncles, cousins all ready to have fun. I'm still laughing about the Dino Dance Chorus lead by Granddad! Love meeting you all! For our daycare/summer camp, Val kept EVERY child's attention throughout the entire hour she was entertaining us. She was silly, fun, excellent with the kids, and even involved the teachers. The teachers were just as entertained as the children. We HIGHLY recommend silly goose and val to anyone that is looking for great, quality child entertainment! Aww - thanks! I had a great time with you as well! Silly Goose & Val Were a Hit! We couldn't have asked for a better act to set the tone for Family Entertainment at the 11th Annual Annapolis Book Festival. With their hand-clapping, cheerful songs, Silly Goose & Val had the audience dancing, laughing, and singing from beginning to end! Consider yourself lucky to have Silly Goose & Val perform at your next event. Val is a gifted entertainer who is sure to please! Oh! Oh! Thank you...how nice! We booked Val for my son's 10th birthday party. He loves ventriloquism and Val brought a dummy just for him to see and use. She even gave him some tips about using puppets with ventriloquism. Val brought many other puppets too and each child got to participate in a puppet show. It was a great time! The children loved her show and so did the parents. I would definitely recommend Val. Thank you Celia! Your boys are super! Not only was the Silly Goose & Val show enjoyed by the children of Antioch Child Care Center, but the staff as well! Vals excitment and genuine love for children was exemplified through her performance and made for a memorable experience! Our children are still raving about the "silly lady with the puppets". THANK YOU VAL! You are sooo welcome! I had a great morning with you! Pure Energized Fun and Completely Brilliant! Silly Goose & Val's performance at our Family Fun Night was pure energized fun and completely brilliant! Parents and children were up to dance, sing, and play along. I received numerous positive comments and will be happy to invite Silly Goose & Val back! Thank you! i enjoyed your families as well! Silly Goose & Val performed as part of our church's concert series last season and it was an OUTSTANDING event! Both Val and Silly Goose brought us outrageous fun, madcap fun, riotous laughter, zany antics, and contagious energy! We were all on our feet, couldn't sit down...couldn't make a frown. Lively songs and smiles galore...we love Val! Silly Goose & Val not only held a successful event at our Church, but the quick response in getting questions answered, booking the event and confirming the date went very smoothly. The age range at our Church family event went from birth thru adult and we all had a FABULOUS TIME. Many of the kids would like to see Silly Goose & Val once again. Aw! Thank you. I had a great time at your church as well! I'll come back anytime. Oh! I have a great Christmas program! We scheduled Val for several of BCPL branches this spring. She is a delight to work with and presents a very entertaining program. Her original songs get the audience up and moving. Silly Goose, and her other furry and feathered friends, add additional charm to Val's program. This program is a winner! On May 16, fifty-eight lucky children and adults had the privilege of watching as Val Smalkin and Silly Goose performed. Ms. Smalkin wowed the audience with her songs, puppets, dances and ventriloquism. This interactive program had the kids on their feet and the adults laughing. An absolutely charming program! my kid loves val and silly goose. val is a sincere performer and gives her best irrespective of the number of people in the crowd. she has always been patient with my little girl and indulged her with silly goose antics. Val and Silly Goose were loved by all the children at our preschool! They had a great time dancing and singing along. Even our smallest students really enjoyed the entertainment. Silly Goose & The Zoo! I have had the pleasure to work with Silly Goose & Val on a number of occasions over the past several years, and I would absolutely recommend her show to any organization! She is energetic, great with kids, friendly, easy to work with and knows how to draw a crowd! My only regret..not having a reason to book her even more often! she's great!! Come see her at the Zoo this fall/spring! Silly Goose and Val were a joy to work with. Very professional and easy to work with. The show was a delight for children and their families. Hope to have them back in Gaithersburg again. Nansie just wrote me: "You are wonderful to work with. I do think your prices are fair. I guess I should have marked them all as above and beyond, but now I don’t know how to change it. I hope it is still a good review. That’s what I was trying to do. No problem, Nansie, 4.8 is good enough for me! 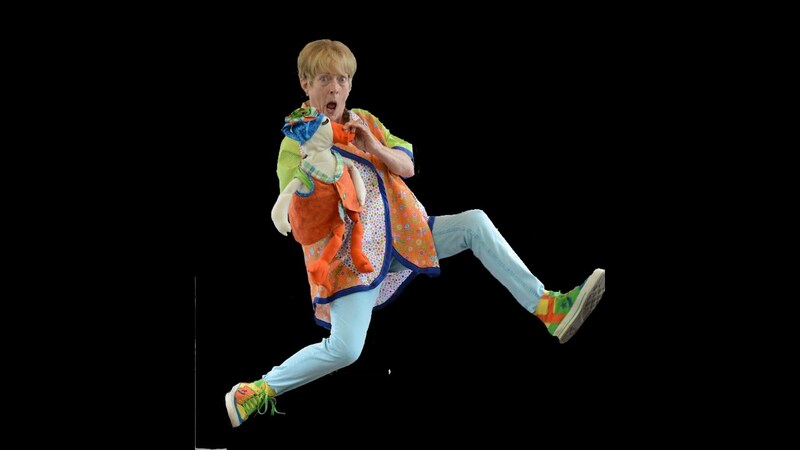 In a children's show audience members will laugh, sing, and dance along with Silly Goose & Val and their assorted friends: Rufus, the Reluctant dragon; the Pink Flamingo Can-Can line; Cyleena, the Sloth; Tingalayo, the Donkey. Val's fresh material, high level of energy, and musicality will delight young and old alike. As one first grade student in Cape May, NJ said, "This was the funnest day!" In an adult show audience members will laugh, sing, and dance along with Val and her more sophisticated friends: Lola, Katerina Collageenyva, the Pink CanCan Flamingos, and more! As one Rotary Club Member said, "This was the funnest night!" Ventriloquist, musician, composer, and performer Valerie Leonhart Smalkin was one of the writers, performers, and co-producers as well as the head puppeteer of the Emmy award winning television program "It's Kindertime" on Baltimore’s ABC affiliate WMAR-TV 2. Val’s CD, "A Gentle Halloween", received a Parents’ Choice Fun Stuff award in 2015, and in 2016 her follow-up CD, "Sing! Sing! Sing!...and Dance! ", garnered a Parents’ Choice Approved award. Her current CD, "Love Bug!" received a Parents’ Choice Recommended award. The title song was one of 5 nominated for "Best Children's Song of 2018" by the Roundglass International Music Awards. Her book "Springtime Dance" took gold in the Moonbeam Children’s Book Awards in 2014. As a recipient of a Maryland State Arts Council grant for solo non-classical performance in 2015, and for solo theatre performance in 2016, Val continues to perform and compose music designed for the 2 to 10-year-old set. As a ventriloquist, Val performs for family and educational events in Maryland, Washington DC, Virginia, Pennsylvania, Delaware, New York City, California, and Brussels, Belgium. As a jazz chanteuse Val performs with the occasional puppet and the Silverback Jazz Quintet in Baltimore, Maryland. Val brings her Bose sound equipment with her which can handle a room of 20 or an amphi-theatre of 600. She asks only that her equipment be shaded because electronics and the hot sun to not get along very well. Thank you. Theodore E. Bear & Val learn and teach how to shake hands. Children become the animals in this guessing game song. and arms to become a frog. based upon Jacques Offenbach’s Orpheus in the Underworld. Rufus, awakened by the noise of the Cancan, stirs, but tries to hide from the children who frighten him, but don’t worry… he gets over it. Silly Goose butchers this simple song but finally gets the right words. is the only three-toed sloth, or at least the only one she can see. 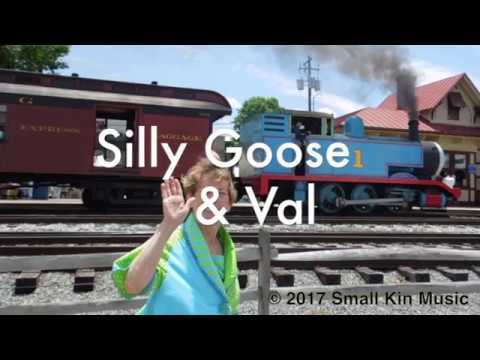 Silly Goose & Val say goodbye with this last action song. Shari Lewis (of course! ), Martha Raye, Ella Fitzgerald, Carol Burnett, Oscar Peterson, Mr. Rogers, Sesame Street, Della Reese, Jay Leonhart, and Patti Page! A stage with steps is preferable, but not required.